Sunday’s Monster Energy NASCAR Cup Series Ford EcoBoost 400 at Homestead-Miami Speedway will be one for the ages – a true clash of the titans. Kevin Harvick, driver of the No. 4 Jimmy John’s Ford Fusion for Stewart-Haas Racing (SHR), is part of what might be the toughest Championship 4 field since the start of the elimination-style playoff format in 2014. That year’s NASCAR Cup Series champion is joined by 2015 champion Kyle Busch, 2016 runner-up Joey Logano and 2017 champion Martin Truex Jr., in a one-race shootout where the highest finisher among the four is crowned the 2018 Monster Energy NASCAR Cup Series champion. Harvick and Busch both have four appearances in the Championship 4 at Homestead since 2014, while Truex and Logano are both making their third appearances. In total, the 2018 edition of the Championship 4 have accounted for 22 wins, 13 poles, 80 top-five finishes, 100 top-10s and 5,230 laps led through this year’s 35 points-paying races. What should make it more interesting is the Championship 4 drivers’ combined resume on 1.5-mile racetracks in 2018. In the 10 Cup Series events on 1.5-mile layouts, the Championship 4 occupy the top four positions in points scored. They’ve combined for eight wins, five Busch Poles, 24 top-fives, 34 top 10s and have led a combined 1,978 laps led on 1.5-mile ovals. Amazingly enough, Championship 4 drivers finished 1-2 in four of the 10 races on 1.5-mile tracks in 2018. At Las Vegas Motor Speedway in March, Harvick and Busch finished first and second; at Texas Motor Speedway in Fort Worth, Busch got the better of Harvick; at Kansas Speedway in Kansas City in May, Harvick finished first while Truex was the runner-up; and Busch got the better of Truex in the Coca-Cola 600 at Charlotte (N.C.) Motor Speedway the last weekend in May. Harvick ranks first with four wins and 867 laps led in those 10 races on 1.5-mile tracks in 2018. He’s also second with seven top-five finishes and a 7.1 average starting position. The No. 4 Jimmy John’s team has set the standard for high performance since its inception in 2014. The 2018 season proved no different as it is tied with Busch and the No. 18 team for a series-best eight points-paying wins. It also leads the Cup Series with a 115.2 driver rating, 22 top-fives, 28 top-10s, 18 stage wins, 51 playoff points, 1,932 laps led, 2,869.12 miles led, 1,258 fastest laps and an 8.236 average running position. The team ranks second with an average starting position of 8.7, average finishing position of 9.0, has 8,398 laps in the top-15 and is tied for second with four Busch Pole Awards. 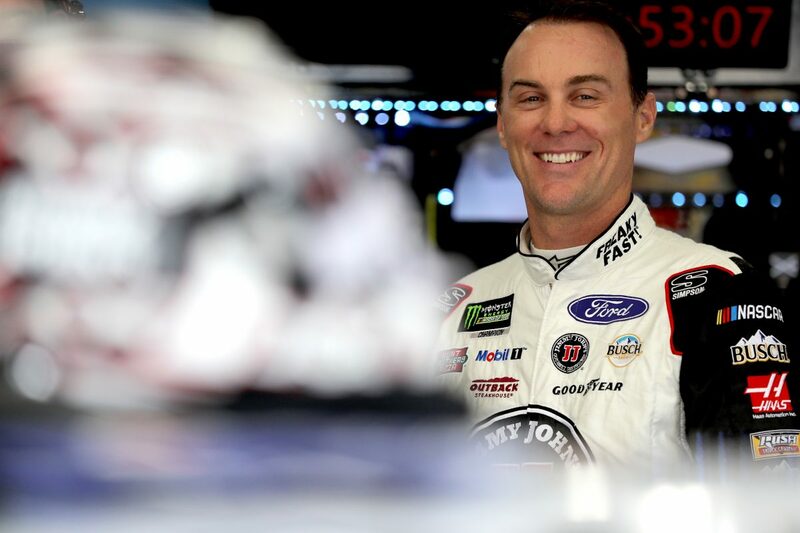 Harvick is also attempting to claim Ford’s first NASCAR Cup Series championship since SHR teammate Kurt Busch hoisted the Cup in 2004 while a member of Roush Fenway Racing. The Bakersfield, California native is also trying to become just the 16th driver in NASCAR history to win two or more Cup Series championships in a career and attempting to become the first driver since SHR co-owner Tony Stewart to win a NASCAR Cup Series title with two different manufacturers. Harvick is attempting to make history and become the first NASCAR driver to win multiple Cup Series and Xfinity Series titles. In addition to his 2014 Cup Series title, Harvick won the Xfinity Series championship in 2001 and 2006. What makes Harvick’s history in the playoffs even more impressive is his eight wins in NASCAR Cup Series playoff races since 2014, tying him with Kyle Busch for the most since the inception of the format. No team and driver have performed better in must-win situations since 2014, and this Sunday’s Ford EcoBoost 400 is the ultimate must-win situation with the Monster Energy NASCAR Cup Series title on the line. The Championship 4 at Homestead is set to become a battle for the ages, which is good since Harvick has age and experience on his side. Describe the emotion, hype and adrenaline before the championship race in Miami? Is there anything outside of NASCAR that you can compare that to? What kind of driver does it take to win a NASCAR championship? What is it like knowing at the end of a race that the championship is right there for the taking?